One mechanism for defeating the vertebrate immune system is to attack the immune mechanism itself. Many helper T cells and inducer T cells are CD4+ T cells. Therefore, any pathogen that inactivates CD4+ T cells leaves the immune system unable to mount a response to any foreign antigen. Acquired immune deficiency syndrome (AIDS) is a deadly disease for just this reason. The AIDS retrovirus, called human immunodeficiency virus (HIV), mounts a direct attack on CD4+ T cells because it recognizes the CD4 coreceptors associated with these cells. HIVs attack on CD4+ T cells cripples the immune system in at least three ways. First, HIV-infected cells die only after releasing replicated viruses that infect other CD4+ T cells, until the entire population of CD4+ T cells is destroyed (figure 1). In a normal individual, CD4+ T cells make up 60 to 80% of circulating T cells; in AIDS patients, CD4+ T cells often become too rare to detect (figure 2). Second, HIV causes infected CD4+ T cells to secrete a soluble suppressing factor that blocks other T cells from responding to the HIV antigen. Finally, HIV may block transcription of MHC genes, hindering the recognition and destruction of infected CD4+ T cells and thus protecting those cells from any remaining vestiges of the immune system. HIV, the virus that causes AIDS. Viruses released from infected CD4+ T cells soon spread to neighboring CD4+ T cells, infecting them in turn. 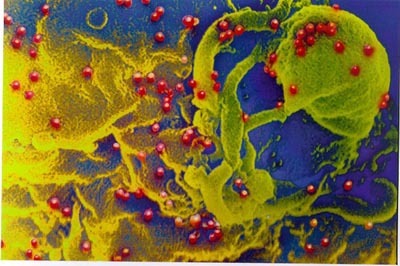 The individual viruses, colored red in this scanning electron micrograph, are extremely small; over 200 million would fit on the period at the end of this sentence. Survival of T cells in culture after exposure to HIV. The virus has little effect on the number of CD8+ T cells, but it causes the number of CD4+ T cells to decline dramatically. inquiry question Are the surviving CD4+ T cells any different than those destroyed? How could you be sure? The combined effect of these responses to HIV infection is to wipe out the human immune defense. With no defense against infection, any of a variety of otherwise commonplace infections proves fatal. With no ability to recognize and destroy cancer cells when they arise, death by cancer becomes far more likely. Indeed, AIDS was first recognized as a disease because of a cluster of cases of an unusually rare form of cancer. More AIDS victims die of cancer than from any other cause.